A massive acoustic playground has been unveiled in Dundee, allowing visitors to embark on a musical voyage of discovery! 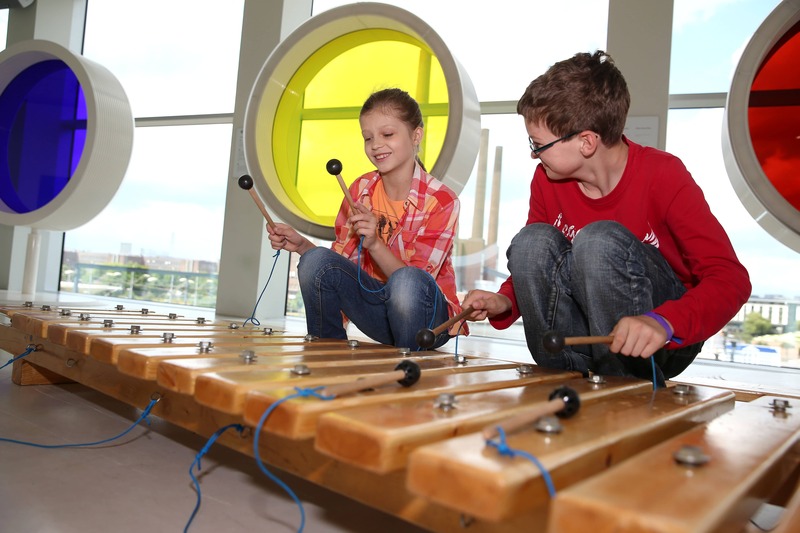 Dundee Science Centre is launching its brand new exhibition – Music Mayhem – Science of Sound – which runs from Saturday 27 June through to Sunday 25 October 2015. The music-making and hugely interactive exhibition, which allows friends and families to play together, will stimulate and sharpen the senses, with exploration and experimentation in sound to delight and engage visitors of all ages. Visitors will be able to generate spectacular sounds and create riotous rhythms, pump up the music on a giant flute or change pitch using their own body weight. With an impressive array of unusual and interactive installations, Music Mayhem’s exciting, creative sound sculptures and good vibrations ensure that this exhibition hits all the right notes! There will also be a collection of curious and wacky industrial, giant versions of standard instruments, giving visitors an insight into how they actually work. The exhibition has been designed by Michael Bradke of MobilesMusikMuseum and is appearing in the UK for the first time. A number of shows will also be offered daily, to complement the exhibition itself. Children under the age of five can hop on the “Musical Mystery Bus”, as their imagination takes them on a musical adventure. Youngsters will be able to use a variety of musical instruments, everyday objects and their own hands and feet to recreate the sounds of exciting destinations. Meanwhile, interactive sound show “The Sound of Science” – aimed at anyone wishing to make a racket! – will explain what sound actually is, and how we hear. A programme of ‘Meet the Experts’ events will also run to complement the exhibition, offering visitors the chance to quiz scientists, technologists, musicians and others about their own experiences or day-to-day jobs. Events will range from drop in activities, talks and demonstrations to themed weekends.